Did you know that the library has passes to lots of museums and local attractions that you can borrow? 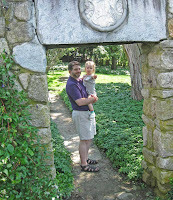 Last weekend, I took my daughter, Lilah, and my husband, Ken, to the Fells in Newbury... for free. We just borrowed the pass in the morning and brought it back in the afternoon. We went to see a new show called "Animal Attractions" and planned to see the Fairy House garden too. We'd never been to the Fells before (and we've lived here for over 10 years! Shame on us!!) It is quite an amazing place! We parked in the upper parking - next time we'll try the lower lot. As the name implies, there is a very long hill that you must push a baby stroller back UP. But there are quite a few very funny animal sculptures to see on the way down, such as an elephant on an ironing board titled "Domestic Diva"! But the first sculptures on the way down from the lot are very scary wolves attached to tree trunks. They are not noticed by little people so don't point them out! (But they are cool and freaky!) There are sculptures of turtles, dogs, horses, fish... spotting them was a high point. 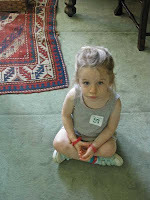 Lilah was obsessed with the actual museum house, but I didn't get a chance to read much about it (next time!) 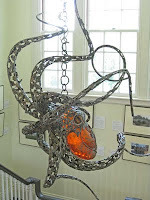 There was an AMAZING octopus made of metal and glass hanging in the stairwell and an exhibit upstairs had a miniature of an old carriage, next to a modern Segway. Lilah was fascinated with the different types of pianos, especially a little spinet-type thing. The gardens are really beautiful with amazing views and hidden steps and sculptures. The pond in one garden was full of tiny tadpoles. We startled the "mommy" frog from her sunbathing. 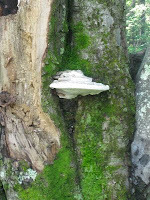 I couldn't recognize many of the flowers - they all seemed like Seuss-type creations to me and an enormous mushroom growing on a tree looked like a flying saucer had smacked into the tree! We didn't make it to the Fairy House Garden this time - it was so hot. But we will go back. The gift shop in the house has trees wrapped in twinkling lights ... and COLD water and yummy chocolate chip cookies. If you are exploring the Fells with kids, you will want to know that there is a fantastic new playground in Newbury, next to the library with a train theme. One section is devoted to bigger kids (ages 5-12, the sign says) and one section is for littler kids. And I like the swings. There are also picnic tables, in the shade. So if you plan your excursion right, you can use the playground as a reward for your kids after the Fells, and bring a picnic lunch too.